Bentley announced a 100-run limited edition, the 202 mph (325 km/h) Continental Supersports "Ice Speed Record" convertible 2012 to celebrate the world's ice speed record. The 6-litre, twin turbo-charged W12 engine, produces 640 PS (631 bhp / 471 kW) - the most powerful Bentley ever - and 800Nm (590lb ft) of torque. Paired with a Quickshift six-speed automatic transmission, it launches the convertible ‘Ice Speed Record’ model from 0-60mph in 3.8 seconds (0-100km/h in 4.0s) and reaches 100mph from a standing start in only 9.5 seconds (0-160 km/h in 9.4s). (Geneva, 28 February 2011) Bentley announces today its most potent and radically styled convertible ever – the 202mph (325km/h) Supersports ‘Ice Speed Record’ convertible. This new model, limited to just 100 cars worldwide, is a celebration of the Company’s world ice speed record set two weeks ago byFinland’s four-time world rally champion Juha Kankkunen in a Bentley Continental Supersports convertible. 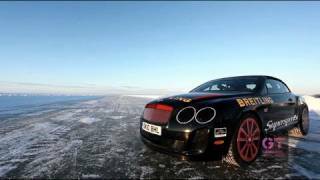 Driving the all-wheel drive, biofuel-powered 6-litre, 12-cylinder Continental Supersports convertible on the perilous frozen Baltic Sea, off the coast of Finland, Kankkunen achieved a speed of 205.48 mph (330.695 km/h) eclipsing his own ice speed record of 199.83 mph (321.6 km/h) set in 2007 in the Continental GT. Both the new Supersports ‘Ice Speed Record’ convertible and Juha’s record-breaking Supersports will be on display on the Bentley stand at the Geneva Show from 1st March. The 6-litre, twin turbo-charged W12 engine, produces 640 PS (631 bhp / 471 kW) - the most powerful Bentley ever - and 800Nm (590lb ft) of torque. Paired with a Quickshift six-speed automatic transmission, it launches the convertible ‘Ice Speed Record’ model from 0-60mph in 3.8 seconds (0-100km/h in 4.0s) and reaches 100mph from a standing start in only 9.5 seconds (0-160 km/h in 9.4s). The additional engine power of the new convertible is the result of fine tuning of the engine to optimise the benefits of the new free-breathing air intake ducts, intercooler system and the exhaust system. And true to the Bentley tradition of delivering instantly available and exhilarating performance in real world driving conditions, the ‘Ice Speed Record’ convertible will sprint from 50-75mph (80-120 km/h) in just 2.5 seconds. In common with its Continental stable mates, the new Supersports model runs on both petrol (gasoline) or E85 bio-ethanol or any combination of the two. Pioneered in the Supersports coupe, this FlexFuel technology offers a reduction of up to 70 per cent in CO2 emissions on a well-to-wheel basis, a measure of a fuel’s net contribution to the atmosphere, not just tailpipe emissions. The on-board fuel supply system monitors the content of the fuel tank and ensures that power and torque remain constant regardless of the ratio of petrol to biofuel. The all-wheel drive system provides outstanding traction in all weather conditions. The drive is transferred between the front and rear axles automatically via a Torsen centre differential. The standard 40 front/60 rear torque split provides optimum traction and modulation of line and attitude by ’throttle steering’ for more enthusiastic drivers. The new exhaust system with reduced back pressure benefits gas flow while delivering a sporty baritone note under hard acceleration. On light throttle cruising, the new Supersports model remains impressively refined. Large diameter (420 mm front, 356 mm rear), carbon ceramic brake discs, with eight-piston calipers at the front provide fade-resistant stopping power. This lightweight system also reduces unsprung and rotating mass, benefiting steering response and handling. As with all Supersports models the ‘Ice Speed Record’ is fitted as standard with Pirelli 275/35ZR20 ultra high performance tyres. 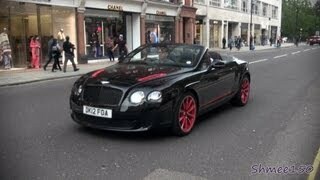 Just 100 examples of this dramatically styled new model will be built at Bentley’s Crewe factory. 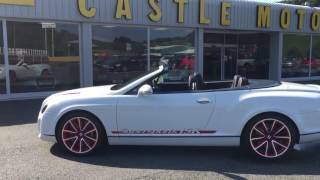 The Supersports ‘Ice Speed Record’ is distinguished by its vibrant and muscular styling cues that reinforce the uncompromising performance credentials of this extreme Bentley convertible. Bentley’s designers have selected three ‘stand-out’ exterior paint colours for the new convertible: Beluga, Quartzite and, fittingly, Arctica White. These colours are complemented by a Dark Grey Metallic soft top with Bentley’s refined three-ply composite construction. The unique appearance of the soft top is created in the outer layer by a 'grey' acrylic fibre with a semi-transparent 'metallic look’ in a twill weave construction. The car’s potent performance is further accentuated by 20” inch, 10-spoke Supersports wheels with a dark tint finish. The dramatic character of the four-seat Supersports ‘Ice Speed Record’ continues in the cockpit in which traditional Bentley craftsmanship and fine detailing are given an even more extrovert interpretation. Traditional leather hides sit alongside a range of contemporary materials for a distinctly sporting style. This includes diamond-quilted Alcantara to doors, quarter panels and seat facings, and ‘soft-grip’ leather on the steering wheel and gear lever. Unique to the ‘Ice Speed Record’ model, the high-gloss carbon fibre on the dashboard, centre console and roof panel, features a unique red weave. The theme continues with Pillar Box red piping to seats and doors, and Pillar Box Red contrast stitching to seats, door casings, steering wheel and gearshift paddles. The front seats and floor mats also feature embroidered ‘Supersports’ legends while the signature Breitling dashboard clock also has a red accent. The Supersports ‘Ice Speed Record’, despite its ice racing pedigree, is clearly no ‘stripped out’ racer. Its highly specified interior has the highly-advanced touchscreen infotainment system from the new Continental GT that provides rich map imagery and a 30GB on-board hard drive. An 8-inch screen displays the car’s audio system, telephone, ride and comfort settings as well as the very latest navigation system, which uses both an in-car hard-disc drive and a DVD player to access route data. It also utilises dynamic navigation to avoid heavy traffic spots, locates destinations using geo-tagged photos from an SD memory card and is Google Maps-compatible for most markets. The infotainment system, with 7-digit postcode entry, combines touchscreen controls and classic Bentley knurled rotary switches to offer instant usability. It is complemented by a new driver information panel (DIP) located in the main instrument cluster. The new wide-screen DIP employs TFT technology and enhanced graphics provide the driver with clear and easily accessible information about a wide range of car systems.